Emily Suvada was born and raised in Australia, where she went on to earn a degree in mathematics. She previously worked as a data scientist, and still spends hours writing algorithms to perform tasks which would only take her minutes to complete on her own. When not writing, she can be found hiking, cycling, and conducting chemistry experiments in her kitchen. She currently lives in Portland, Oregon, with her husband. "I want to buy this YA trilogy about gene-hacking for every teen I know." "It is rare that a series as entertaining and twisty as this is equally exciting in its ethical and philosophical questions. 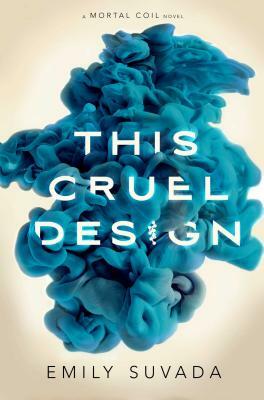 This Cruel Design is a necessary read for critical readers of speculative, dystopian, and apocalyptic literature. This Mortal Coil is among the most important and thrilling new YA series." A new virus threatens humanity in the follow-up to This Mortal Coil (2017). It’s only been a week since 18-year-old crackerjack coder Catarina “Cat” Agatta sent the vaccine she helped develop into the gentech embedded in every person, eradicating a terrible virus that caused its victims to detonate, leaving survivors holed up in underground bunkers. Unfortunately, Cartaxus scientist Dr. Lachlan Agatta, who taught Cat everything she knows, and who she thought was her father until recently, has fled, taking his plan to recode humanity with him. Cat and her companions must stop Lachlan and find a way to head off a new strain of the virus that kills even faster than the last before Cartaxus takes extreme measures. Additionally, Cat’s suppressed childhood memories are coming back with a vengeance, and she must come to terms not only with her identity, but also her destiny. Suvada has created a fascinating, complex world where DNA can be easily manipulated (and where race isn’t easily defined) and technology can open the mind to endless possibilities. Respecting her readers, she offers plenty of food for thought about how far technology can take humanity and how far we should let it. Plenty of (occasionally terrifying) action and twists keep the pages turning all the way to the revelatory finale. New readers may be a bit lost and will want to begin with the first volume.